Since I already had experience with the P300, I felt I could navigate the controls and hookup of the P600 with no problem. The P600 is not only more flexible (more outlets) than the P300, but handles twice as much voltage. The unit itself is rather large but fit sideways into my rack. It ran much cooler than the P300 did. In fact, after a full day's use, it was only warm to the touch. In addition to the normal manual (that seems to be more complete than the previous one I had,) there is a nice little pamphlet on Multiwave-what it is and how to use it. Like the P300, the P600 has adjustable voltage, output frequency, and output waveform (via Multiwave settings). The manual recommends at least 150 hours of break-in, so I let music play for a couple weeks and I watched quite a few movies. Because of the higher voltage rating, I was able to connect my projector directly to the P600. Unfortunately, I was not able to connect my projector, amplifier, preamplifier, and my computer at the same time. When I did have them all connected, the amber warning light came on as I was checking the power draw. The manual states that the unit should not be operated with the amber light on. I would either require a P1200 or another power plant in addition to the P600 to make use of its capabilities with all my electronics. I intended to utilize a VAC DAC II Mk II as a companion D/A converter along with my Philips CD changer. Unfortunately, either the tubes are going bad or something else is problematic with the unit because there was a constant buzz that I was unable to eliminate no matter what I did with the rest of the equipment. The Audio Research has always been sensitive to grounding issues, but in this case I was unable to get a quiet background. I did not want to try and float the ground on the D/A because the last time I did something like this I ended up receiving a nice jolt of electricity. I tried combinations of plugs, floating the ground on the preamp, going direct to the wall, etc. Then I tried the components connected to the RGPC 1200S and had the same exact problem. So, the D/A was out of the system, and I had to resort to reviewing the P600 with the output of the Philips CD changer. In some ways this was disappointing, but perhaps it allowed me to hear some of the differences between power devices more clearly. It also simplified moving power cords for testing as now I only had to move three back and forth (and didn't have to worry about warming up tubes). I am a firm believer in comparison testing. It is easy to say a product is good or bad, but without taking into account similar items (especially in the same price bracket) it is much less meaningful. Not only does it help in eliminating careless subjective opinions (hopefully), but it also helps put results in perspective. I compared the PS Audio P600 directly to the Richard Gray 1200S. To enable quick comparison testing I connected the RGPC to the dedicated line with a fourplex outlet. When it was in use, I connected the amplifier to an adjacent outlet and the preamplifier on one of the sides of the 1200S and the CD on the opposite side. I connected the P600 directly to a second line and connected the amplifier and preamplifier on one side and the CD player on the other side. Power draw registered approximately 200 Watts. I left the unit in the Sine mode because this is compatible with every type of equipment. I was able to switch between the RG and the PS and vice versa in about 15 seconds. I would go back and forth again and again. First I would start with a particular piece of music and just listen to it for possible cues that would help in determining differences between the two components. Then I would switch back and forth and note things that I felt were sounding different. After I felt comfortable with the song that may have taken up to 6 or 7 samples, then I would start noting differences on my pad. In addition to the comparison testing, I listened to the differences between the SS1 and Sine wave modes. NOTE: Keep in mind that the P600 improved upon the direct connection to the wall in every way. Results of this type of comparison are in the original P300 review. 1. I began the serious listening with track 2 from Patricia Barber's Nightclub. With the equipment connected to the P600, I noted that there seemed to be more high frequency content in the recording that made reverberation in the recording more noticeable than with the RGPC. The sibilance on Patricia's voice also became more prevalent. The overall presentation was a little on the polite side with a softer piano sound. When listening to percussive sounds like the cymbals, it was easier to make out individual 'hits.' When the sound faded out into quiet, it seemed to disappear completely while there seemed to be more of a slight background with the RGPC. Some of this could more be attributed to the change in dynamics and transient response that occurred. When there were shifts in loudness, the transition between the sound and the lack of sound was more abrupt. It was as if the RGPC somehow slowed this process or the P600 speeded it up. With the equipment in the RGPC, the cymbals were more present, and there was an added sense of richness to the voice. The attack of the piano was sharper and made the sound more there. Percussive sounds in general were less delicate and brasher sounding. Soundstage was wider and analogous to a warm blanket-big and encompassing. 2. Next was track 4 from Kenny Loggins Greatest Hits. With the P600, the sound came from farther back. Again, transients seemed to be more noticeable, or possibly elevated levels of high frequencies contributed to this feeling. Sound seemed quicker. With the RGPC there was a greater sense of space and things sounded more spatial. The sound was mellower and instruments had a slight edge to them. 3. Gerard Schwarz and the Seattle Symphony along with Janos Starker on violoncello perform Dohnanyi's Konzertstuck on Delos DE3095. I listened from the beginning of the Allegro non troppo. The PS Audio made the violoncello sweeter, had a larger sound field and sounded sharper. Bass appeared a bit more powerful, and midrange in general was bigger, larger, and just plain more. Sound was edgier with the 1200S. There was more separation between instruments, and each occupied their respective place in the soundstage without interfering with the sound of other instruments. However, the overall presentation didn't seem to come together as naturally as the PS Audio even though individual sounds were easier to pick out. 4. String plucks from track 7 off Madonna's Music album were smoother on the P600. Vocals had a chalkier sound to them, but were not as sibilant as on the RGPC. Bass seemed punchier, and it was more noticeable when sound trailed off on instruments and vocals. Vocals were spittier on the 1200S, and the sound was more upfront. There was more sizzle and sharpness to the sound as if the treble was turned up. Lower bass seemed fuller. 5. From the soundtrack to Listen Up about Quincy Jones, I listened to track 1 and the beginning of track 2 that has spoken voice. With the P600, the sound was more solid and confined to a fixed space, and there was the sense of a reduction in the level of hash. Also, there was more reverberation. Voice was more open and more 3D in comparison to the RGPC. With the RGPC the sound was fatter, high frequencies had a lighter quality to them, and the sound space seemed more opened ended. 1. The SS1 mode is the preferred Multiwave mode according to PS Audio. I only did comparisons in this mode. With track 2 from Stevie Wonder's Song Review, the Sine mode was not as clean as the SS1 mode. Everything sounded "noisier." The SS1 mode makes my CD player's display do weird things and it causes a slight physical noise to be emitted from the player itself, but it also increased focus and improve overall fidelity-needless to say, I left it this way for regular music listening. 2. Fritz Reiner conducts the Chicago Symphony with Artur Rubinstein on piano for Brahms Concert No. 1 on RCA 5668-2-RC. With track 3, the Rondo, the SS1 mode stepped up the resolution of the system a notch. The image became more solidified, the tones of the piano became more natural and it sounded more like a real piano. The nagging sense that something is missing went away and the sound became "righter." It may be a hard thing to describe, but every audiophile knows what it is-an improvement in resolution, a decrease in distortion, removal of a shroud holding back the true sound of a recording and propelling the listener into the illusion of "being there." I spent many hours watching movies with my projector and computer (with a DVD drive) that connects to it. I couldn't think of an easy way to go back and forth plugging and unplugging the projector to determine if the video was improved-I didn't want to keep shutting it off and having it cycle up. I can say that the image always looked good with no interference and had a solid picture while connected to the PS Audio P600. Video is where I would guess the difference could be dramatic depending on what ancillary equipment (i.e. television, DVD, VCR) is used. The manual is very encouraging about experimentation to achieve the best performance from the PS Audio P600 power plant. Changing power cords is one of the suggestions as well as trying different Multiwave patterns and listening to the results. Even if you are not the experimental type you can always go to the default mode and be assured that an improvement has been made to your system. The P600 offers twice as many outlets as the P300 and twice as much supplied power. For most people this would be more than enough. In my system I would need a P1200, or need to use a combination of a P600 and another power plant in order to have my projector and amp plugged in at the same time. 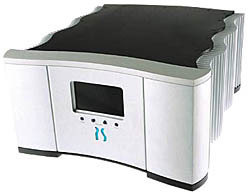 As in my previous review, the PS Audio P600 was a tremendous improvement in the sound of my system and I wouldn't hesitate to recommend it to anyone looking for an improvement to the AC supplied to his or her audio or video equipment. Benefits over the P300 were: cooler running, more outlets, and higher voltage capacity. 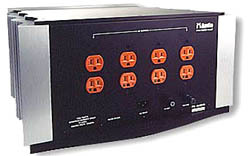 Regenerative AC Synthesizer that handles 720W draw; 2 pairs of four hospital outlets with each set wired separately; heavy duty detachable IEC power cord; adjustable output frequency 50-120Hz (5 Hz steps); adjustable output voltage (1 V step); power meter (draw) for output; 10 MultiWave preset patterns; 3 year manufacturer warranty. 16.9" W x 9" H x 19.4" D. See website for more detailed information. Also see our review of the Model P300.